Instead of oysters, add quahogs to stuffing for fish and even turkey. 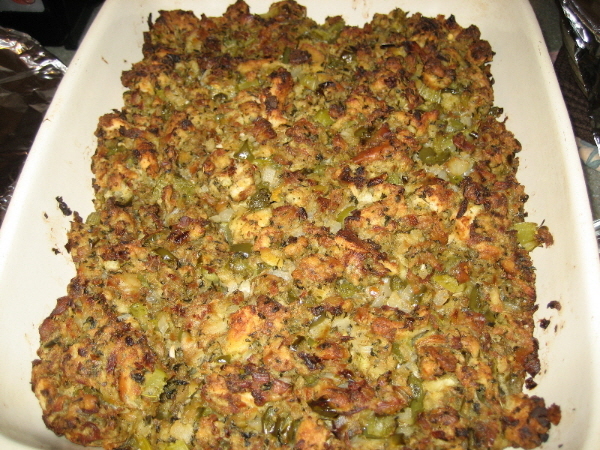 A real Rhode Island Thanksgiving should have quahog stuffing for the turkey. This recipe posted on net by a contributor from southern New Hampshire seems delicious. Start with 2 dozen quahogs. Cook and set aside to cool. Once cool, remove from the quahogs from their shells, and chop them into chunks either by hand or in a food processer. Do NOT purée. Next, chop a large onion, a green pepper, 2 celery stalks, and 4 cloves of garlic. Melt 1 1/2 sticks of butter in a large heavy fry pan.and sautée the vegetables until translucent, adding the garlic last so it doesn't burn. Add the chopped clams, 4 tbs of chopped parsley, and 2 tbs of sage, salt and pepper, 1/4 tsp of Tabasco, and some red pepper flakes to the mix. Add 1 cup of either white wine or a mix of wine and clam broth, and then mix with 1 loaf of dry bread cubed or torn apart. Bake in the oven in a baking pan to get more of the top browned. It's also very good when put back in the shells.